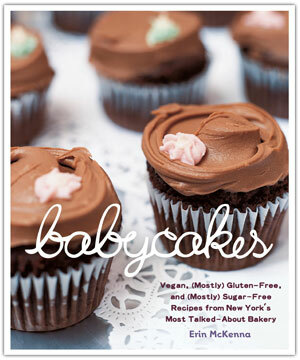 I picked this book up from the Library because it was on display and those cup-cakes looked so yummy! And to top it off, this cook-book is all vegan and mostly gluten-free and mostly sugar-free!!! The author is Erin McKenna and she has a bakery in NYC where she bakes and sells all these yummy treats – those lucky New Yorker’s! She has a few recipes that use spelt flour, but for the most part, she uses a combination of alternative flours in all her recipes that completely replace wheat. It’s funny, but I seem to be meeting more and more people who are avoiding wheat and – and if you are one of those people, I would highly recommend this cookbook, being able to make yummy things even with diet restrictions is HUGE, as I have recently discovered. And I am very excited about her recipe for vanilla frosting that does not include dairy (which Sophy seems to be sensitive too) and it just seems a little bit better for you – she uses soy milk, soy milk powder, and coconut oil to name a few ingredients, but the end results look amazing! And she even has tips to naturally dye your frosting to avoid those chemically laden food colours which for those of us who have kids who are sensitive to artificial colour, is fantastic. So even though we don’t have wheat problems here, it’s still a great cookbook and I can’t wait to try to make her Apple-cinnamon toastie – pg 58 or her gingersnaps – pg 67!